This is the accompanying website for the paper Constraint-Based Time-Scale Modification of Music Recordings for Noise Beautification by Meinard Müller, Helmut Hedwig, Frank Zalkow, and Stefan Popescu. This website requires a web browser that supports the Web Audio API for playing back the audio material (e.g. Mozilla Firefox version ≥ 25, Google Chrome version ≥ 14, Microsoft Edge version ≥ 12). In magnetic resonance imaging (MRI), a patient is exposed to beat-like knocking sounds, often interrupted by periods of silence, which are caused by pulsing currents of the MRI scanner. In order to increase the patient's comfort, one strategy is to play back ambient music to induce positive emotions and to reduce stress during the MRI scanning process. 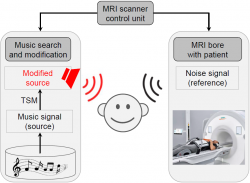 To create an overall acceptable acoustic environment, one idea is to adapt the music to the locally periodic acoustic MRI noise. Motivated by this scenario, we consider in this paper the general problem of adapting a given music recording to fulfill certain temporal constraints. More concretely, the constraints are given by a reference time axis with specified time points (e.g., the time positions of the MRI scanner's knocking sounds). Then, the goal is to temporally modify a suitable music recording such that its beat positions align with the specified time points. As one technical contribution, we model this alignment task as an optimization problem with the objective to fulfill the constraints while avoiding strong local distortions in the music. Furthermore, we introduce an efficient algorithm based on dynamic programming for solving this task. Based on the computed alignment, we use existing time-scale modification procedures for locally adapting the music recording. To illustrate the outcome of our procedure, we discuss representative synthetic and real-world examples, which can be accessed via an interactive website. In particular, these examples indicate the potential of automated methods for noise beautification within the MRI application scenario.